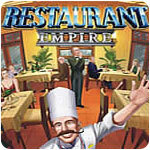 Restaurant Empire Game Review - Download and Play Free Version! Start With Just Some Cash and a Dream and See if You Can Build a Restaurant Empire! Control All Aspects of a Restaurant Business Including Cooking, Hiring Staff, Decorating, and Creating a Menu! Meet Armand LeBoeuf, a young French chef with big ideas who has just inherited his uncle's restaurant, and the hero of our story! It's up to you to help Armand realize his lifelong dreams. How, you ask? Why, by using your business savvy to turn his single restaurant into a sprawling Restaurant Empire! Start your journey in one of three world-class meccas of fine cuisine: Paris, Rome, or Los Angeles. Aid Armand in his fight against Omnifood, the powerful and devious international conglomerate bent on dominating the industry. Will his rags-to-riches fairy tale come true? In a striking way, Restaurant Empire combines the best of the business simulation genre with a detailed, interesting storyline to give you a totally unique game! In the campaign, follow Armand's rise to the top through 18 detailed scenarios. Your missions start off easily and get more challenging as you go along, and there's a extensive tutorial to introduce you to the basics and finer points of Restaurant Empire. For a different game experience, play sandbox mode where you have the freedom to build your business however you want! Tons and Tons of Gameplay Variety for Your Enjoyment! Restaurant Empire includes almost anything and everything you can think of having to do with restaurant management! You hire the staff: servers, captains, kitchen porters, and, of course, chefs. There are 37 unique chefs to work with, many of them popular celebrity chefs in real life. Each one has his or her own set of strengths and weaknesses in areas like appetizers, main courses, and soups, and in French, Italian, or American food. As your Restaurant Empire grows and you acquire more restaurants, make sure you hire the right personnel for each one! You have an almost dizzying range of options available for building, decorating, and managing. Choose between 5 cuisine options, over 300 recipes, and almost 200 decorative items! Create the menu and adjust the quality of ingredients to move prices higher or lower. Buy new recipes and insider info on secret ingredients and food preparation. Change the physical layout of your restaurants for the most efficient setup possible, and cook food. You can even compete in Iron Chef-style cooking contests! Will you survive the cutthroat restaurant business, or will the competition eat you for lunch? It will take dedication, perseverance, and real world entrepreneurship skills to gain the upper hand, so start building your Restaurant Empire today! Restaurant Empire is a game that gives players a taste of what running a restaurant is really like. You will play the role of Armand LeBoeuf, nephew of famous French restaurateur Armand LeBoeuf. Your goal will be to restore your uncle's restaurant to its former glory. 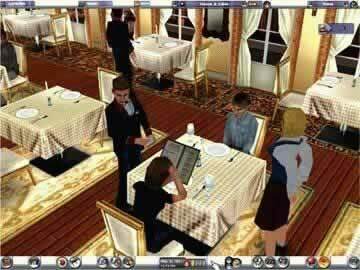 Does this game deliver a satisfying restaurant simulation experience? Read on to find out! If you have ever been frustrated by a lack of realism in games of this type, this is the game for you. Restaurant Empire presents a restaurant as a complete, interdependent system where one thing has an impact on everything else. This complex system allows for high levels of tinkering and management which in turn leads to a very full experience on the part of the player. Everything can be adjusted to yield better and better results. The player is given free reign of everything, even during the exhaustive tutorial. Once the tutorial is over, this game won't be holding your hand. You may feel free to take your restaurant in any direction you want, completing the missions the way you see fit. Choose your staff, recipes, and interior design. Everything has a set of stats and attributes that effect the overall rating of your restaurant. Strategy in the management of the establishment is essential for success. If you love to analyze and strategize, this game will be just perfect for you. This game has a surprising amount of depth. Rather than simply providing the most basic information about recipes, the game instead offers up enticing descriptions of each and every dish. Ingredients are explained with a flare that Food Network would be proud of, and relevant historical facts are sometimes included as well. 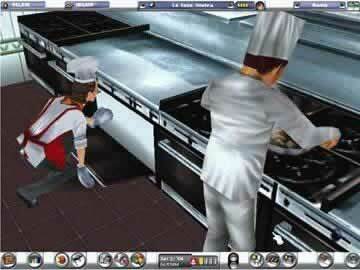 You will likely find yourself seeking out local restaurants that serve some of the dishes featured in this game. Yummy! The decorations have the same amount of detailing, giving the feeling of really decorating an uber posh dining establishment. You may take as much or as little time on the aesthetic of the restaurant as you like. Having the right staff for your restaurant is crucial for success, but better help equals higher pay in return. On the other hand, cheaping out on help results in customer dissatisfaction and lower earnings. Balancing the need for quality help with the funds on hand is key to running a successful restaurant. Is someone just not cutting it? Fire at will! This game is long in addition to being incredibly complex. 15 different missions will keep you playing for a long time to come. Very nice. For the fan of casual gaming, normal speed is where it's at. For the impatient, simply speed things up. 2x, 3x and 4x speeds give you complete control over your own personal gameplay experience. An ingame month can go by in the blink of an eye at 4x speed. Most players will likely opt to play at a lower speed, but it's a very nice touch to have the choice. The art style of Restaurant Empire is serious and grown up without a hint of zaniness or silliness. Everything is elegant and classy, from the buildings to the posh interiors. If you've found yourself frustrated with the childishness of other games, this game will be a breath of fresh air. It's classy but never boring. The storyline isn't particularly deep, but it is clearly aimed at the more mature crowd. Dear uncle frequently refers to the fact that the stress of the competitive restaurant business caused his prostate to "act up", whatever that means. This game is complicated! The tutorial goes over most everything you need to know, but it's hard to remember where everything is located. In time, the complex controls will become second nature, but until that time it's very difficult to get around. Little things like rotating furniture are pretty hard to do as well. If only this could have been made simpler! Crazy as it sounds, adding a menu to objects such as furniture when they are right clicked would have saved players a lot of headache. Nevertheless, the game is good enough to justify the learning curve. The graphics in this game would have been excellent in the mid to late 90's, but are very dated by today's standards. Choppy isn't even the word for it. However, the graphics are only dated, not bad per se. For what they are, they're very good. A lot of love and care went into the art design, despite the limitations of the graphics themselves. The result is a curiously well detailed, classic looking game. Where the game really shines is in the look of the buildings. The landscapes and architecture look superb. The interior elements are fantastic as well, with rich fabrics and finely detailed furniture. Most importantly of all, the food looks good enough to eat. Bon appetit! An innovative feature in this game is the fact that you will receive feedback directly from your own customers. This is a unique way for the game to provide suggestion and direction in an indirect way. Following the advice of your customers leads to a better and more successful restaurant overall, so always take what they have to say seriously. This game is a brilliant representation of restaurant management from the bottom up. It's complex and detailed without being bogged down with excessive features. Restaurant Empire is nice and long, guaranteeing many hours of entertainment. As such, this game scores 8.0. An absolute must play for anyone who enjoys a good business simulation game. Player created video showing various aspects of the game.